PlayFusion and Games Workshop have announced that the super-popular and hugely successful trading card game Warhammer Age of Sigmar: Champions is headed to Nintendo Switch. 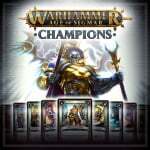 For those not in the know, Warhammer Age of Sigmar: Champions is a collectable card game that blends physical and digital card collections; essentially, players can scan physical cards into their collections to claim them and then take them on to conquer the battlefield. The game has now sold more than 20 million physical cards and more than 1 million digital matches have been played. Today's announcement also reveals that the game is coming to Steam in February; the Nintendo Switch version is expected later in "Q1" 2019. Are you a Warhammer fan? Will you be picking this up on Switch? Tell us below. I've never played this game and I know hardly anything about it, but more big games on Switch can never be a bad thing so this is good news to me! Whilst I am interested in Warhammer Fantasy/AoS games I have never been bothered by digital Card Games. Here is hoping a good studio does a Souls-esque Warhammer game at some point in the near future! Wow that's some of the best looking game play footage i'v ever seen! I hate game trailers like this if i wan't to watch CG i would watch the Lord Of The Rings Trilogy. Man. I got super excited seeing Warhammer. Shame, I don't play digital card games. Probably trying to take advantage of Blizzard's refusal to port over a certain other fantasy card game. Can we have Warhammer Quest instead? Not so interested in a digital card game. This trailer just says nothing about the game. Sad because I was interested before... so hopefully there will be a second trailor anytime soon. How super popular and hugely successful is this? I'm familiar with other Warhammer games, but not this card game. I play a lot of TCGs and I don't know anyone that plays this digital one. I love cards. Bring it on! 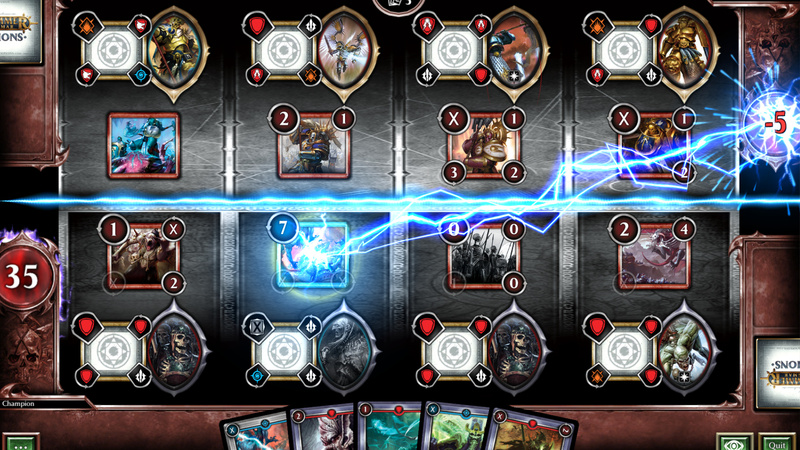 Personally I'm quite happy to see these digital CCG's coming to Switch. I love digital card games...always have...back from when Magic first went online all the way till now... Lightseekers is very interesting, but I want that "on tv" patch to come out before I can really get into it, I think...some of the text just seems too small for me on the portable screen. However the mechanics of Lightseekers are quite interesting and new for a CCG, as far as I know. Can't wait to see what this one is like! @JaxonH Wait...seriously? How come I never heard about that before now??? The video game based on the card game based on the table top game loosely based on the roleplaying system loosely based on JRR Tolkiens fantastic novels. @GrailUK @JaxonH I must echo this question. For the Emperor! I am Yay Warhammer and meh trading card game. Really torn on this one. Warhammer Fantasy is my preference so I doubt ill be grabbing the 40k game. Warhammer reminds me of TotalBiscuit. He reviewed a bunch of Warhammer content. Man, I miss that guy. So sad how he passed away. Me: Ooo, Warhammer on Switch. Also me: Oh, it's a card game. Any chance of Gwent on Switch? @Digimmortal have you this game? I like lightseekers but I hate that a mojarity of these digital card games do not let you do anything during your oppwnwnts turn. I wish MTG would release on the switch. No I don’t have the game. My friend owns a games shop. When I told him about the digital version of Lightseekers he filled me in about the Warhammer Champions card game. Sounds good and I do like Lightseekers so I’ll give it ago. There isn’t much Chen time in Lightseekers I’ve found. Plus you can look at yours and their cards whilst they take their go. Age of Sigmar and a collectible card game. How many layers of cancer can we get?